Move from Monday to Sunday in impeccable chic. These leggings give you the stretch and flexibility you crave in a versatile wardrobe. My daughter just told me I look slimmer as Im wearing these today!! 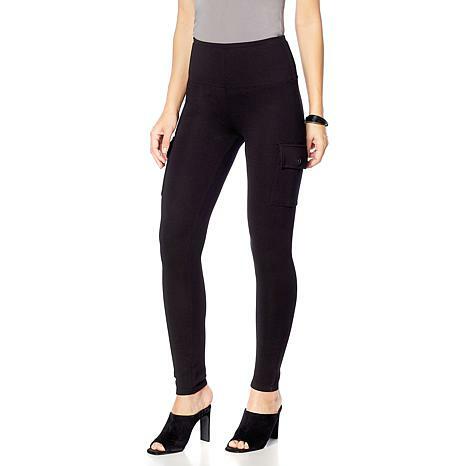 Im 511 and usually dont order pants on line because I usually need to try on for length but I know leggings can cover extra length or I can push up to capris. These fit me perfectly!! Very good weight and quality. The cool cargo pocket is placed perfectly mid thigh and holds an iPhone. I love these! Thanks Marla for meeting needs of comfort in fashion! I wore the leggings for the first time to a brunch to celebrate my grandson's 20th birthday. They were AWESOME!! My husband paid me the nicest compliment!! 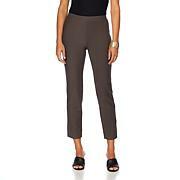 These are my kind of leggings.Thank you Marla and HSN. I have purchased both colors and hope Marla will make more in different colors. Love the way they look and fit. Really a fan of what Marla has brought out in her collection. Im 52 and have on an XL. Im wearing a flat boot and Ive received two compliments already! Not a fan of pull on pants, but they allow for a complete flat front without a button or placket protruding through my sweater. Im glad I made this investment.